“South Carolina Probate Records, Bound Volumes, 1671-1977, Volume C, page 75, Image #53.” Will of William Crain, 27 Jan 1842, FamilySearch (https://familysearch.org : accessed 2014) citing Department of Archives and History, Columbia, South Carolina. The problems of the impermanence of a Uniform Resource Locator, aka the URL, is a subject of many articles. One such, published in 2011 the abstract of which is located on PubMed.gov, gives some insight into the problem. The url’s cited in 121 studied scientific articles found that 15% were “inaccessible at the time of publication.” A loss of “35% of the original URLs” is observed over the eighteen month time period of the study. The authors recommend the use of webcitation.org to archive articles. Their study reports no loss of the archived articles during the study period when using webcitation.org . According to the FAQ’s on WebCite® they are “operated and supported by publishers” so there is high likelihood that their site persists. Personally, I find drilling down through a site to be time consuming and fraught with wrong turns. I prefer clicking the link in the document and being taken directly to the document. 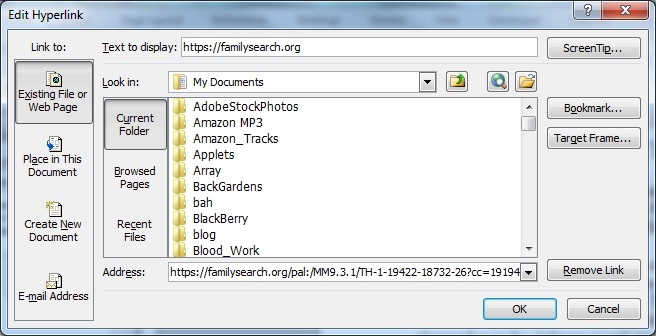 Lately, I have noticed that two of the sites I frequently visit, Ancestry.com and FamilySearch.org, seem to be using permalinks. I have not observed instability of links in my citations to those two sites in the past 18 months. However, the links can be very long. To remedy this, the hyperlink can be edited, so that the display text matches the short link, displayed above, while the hyperlink is preserved in the Address text. To locate the hyperlink editor in word, right mouse click on the link in word and select Edit Hyperlink from the menu. The top box is the display text while the bottom is the Address. The text in the citation was edited to achieve the shortened style but with the information for the permalink imbedded in the URL for ease of access. Until such time that Persistent URLS, or PURLS are used with consistency, in which URLs persist across time, we need a way to access links in citations quickly and accurately. Also, the link in the citation needs to be short so that the citation doesn’t fill the page. For my citations going forward, I plan to archive sites using webcitation.org and edit the hyperlink when necessary to shorten the citation. Yesterday, I was thumbing through the binders, my old, not yet fully retired, system for organizing the family info, when I came across a land record for a George W. Crawford in Arkansas. I printed it years ago from the bureau of land management’s online records. At the time I wasn’t sure if it was “my” George Crawford (1810, NC – aft 1880, prob. AR) or “the other” George W. Crawford (1813, TN – 1882, AR). I didn’t have time to look at it in depth, so there it stayed, forgotten, tucked in amongst other forgotten pieces of miscellaneous Crawford “documents”, until now. For reasons of doing better genealogical work and cleaning out some paper, I want to determine if this land belonged to my ancestor or another George. Good genealogical research requires one to work from the known to the unknown. One George, “my” George W. Crawford, is found in Mississippi in the census records of 1850, 1860 and 1870. 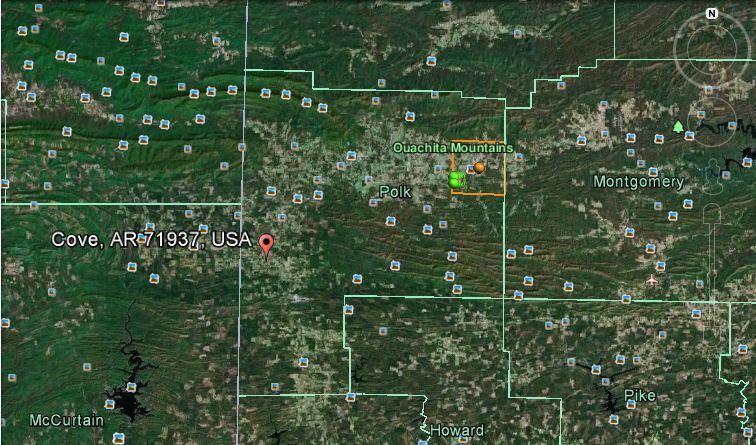 Nearby is his likely father, Thomas, who can be found in the 1840 census of nearby Pickens County, Alabama with a male appropriate to George’s age category in the household. In 1841, in Itawamba County, Mississippi, George married Jane Mangum. Jane is the daughter of John Mangum, who also lived in Pickens County, Alabama, and was enumerated there in the 1830 census prior to moving to Itawamba County, Mississippi. After the end of the Civil War, and after living in Mississippi for most of his adult life, George and his family moved to Polk County, Arkansas. He is enumerated there as G. W. Crawford along with his family in 1880 in Cove township. 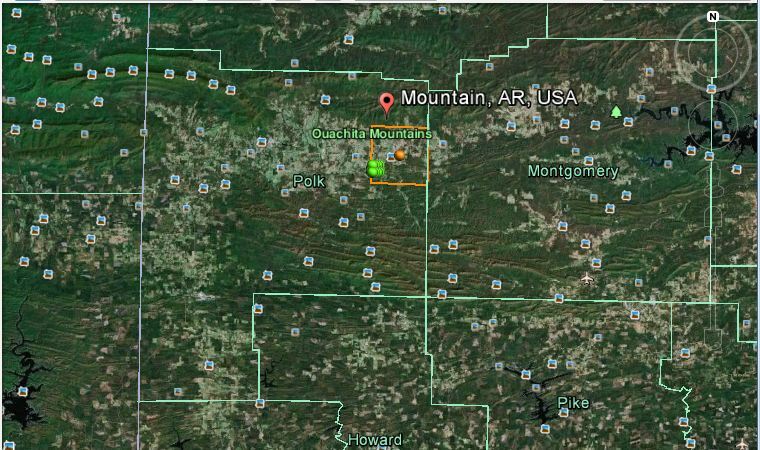 Also in Polk County, Arkansas, in Mountain Township in 1880, is another George Crawford. This George is enumerated in Marion County, Arkansas in 1850, then in Mountain, Polk County Arkansas in 1860, 1870 and 1880. Many people have confused the two and mashed them into one person. An examination of their family members shows that they aren’t. That’s a topic for another blog post. The land record is for land in Polk County, Arkansas, S30, T2S, R28W of the 5th Principal Meridian, filed with the Bureau of Land Management in 1890. Whose land record is it likely to be? Both men are said to be deceased by this time. However, filing BLM records years after the actual possession is not uncommon. The land record could be for a son, as both had sons named George W. Another possibility is that the land was granted to an unrelated George Crawford. It was not uncommon for people to receive land grants in a place where land was made available which was not where the applicant lived. The land was then sold for cash to buy land closer to home. There are nearly 800 George Crawfords listed in the Ancestry.com census index search for 1880. Given all those possibilities, it still could be the land of one of the Polk County men or their sons. But which one? Is there a way to find a clue regarding to whom the land was granted? Can we learn anything about what family might have owned the land before looking at the deeds in the courthouse or on microfilm? The date is not particularly helpful. Is there any other information which can be determined just from the land record? Geography may help. Cove is in the Middle of the county, Mountain is in the northern part of the county. Is there a way to use the Township and Range of the land grant to determine where where this land is located relative to the townships, above? Ordinarily, the bureau of land management’s online records are the starting place to locate the lands. However, for whatever reason, the page refuses to load for me today. I don’t own a plat map of Arkansas. I need to find another way to find the land on a map without spending money. Because I’m cheap. Did the name Crawford in my ancestry not give you that hint? Fortunately, there is a site, Earth Point with a Township and Range Search, which works with Google Earth to map the land description! These are both free! The results, though not absolute proof of which family likely owned the land, were very interesting. This map made the relationships much more clear. Though more research is needed in the deed records of the county in order to be certain, the land is likely that of a George Crawford who lived near Mountain Township. Unfortunately, I probably still need to keep the copy, if only to be able to point to it and say: “Not our George”. 1850 United States Federal Census, District 6, Itawamba, Mississippi, Population Schedule, page 313A (stamped), dwelling 156, household 159, entry for George Crawford, 40, born in NC, Ancestry.com, (http://search.ancestry.com/iexec?htx=View&r=an&dbid=8054&iid=4200044_00172&fn=George+W&ln=Crardford&st=r&ssrc=&pid=3427234 : accessed 2012) digital image online of NARA Microfilm Publication M432, roll 373, Washington, D. C.
 1860 U.S. census, population schedule, Itawamba, Mississippi, Population Schedule, page 204, dwelling 1344, household 1344, entry for George Crawford, 60, born in NC, Ancestry.com, (http://search.ancestry.com/iexec?htx=View&r=an&dbid=7667&iid=4233366_00211&fn=George+W&ln=Crawford&st=r&ssrc=&pid=38703049 : accessed 2012) NARA microfilm publication M653, Roll 583, Washington, D. C.
 1870 U.S. census, population schedules, Itawamba, Mississippi, page386A, Household 243, Family 243, entry for George Crawford, 55, born in S. Carolina, Ancestry.com, (http://search.ancestry.com/iexec?htx=View&r=an&dbid=7163&iid=4273831_00107&fn=George&ln=Crawford&st=r&ssrc=&pid=36222712 : accessed 2012); digital images online of NARA microfilm publication M593, roll 732, Washington, D.C.
 1840 United States Federal Census, Pickens, Alabama page 337 (stamped), entry for Thos Crafford [sic], one male 15-19, one male 20-29, one male 30-39, one male 50-59, one female 20-29, one female 50-59, Ancestry.com, (http://search.ancestry.com/Browse/view.aspx?dbid=8057&path=Alabama.Pickens.Not+Stated.65&sid=&gskw=Thos+Crafford : accessed 2012) digital image online of NARA microfilm publication M704, roll 12, Washington, D. C.
 1830 United States Federal Census, Pickens, Alabama, page 111 (stamped), entry for John Mangum, one male 5-9, two males 10-14, one male 15-19, one male 60-69, one female under 5, one female 5-9, one female 10 – 14, one female 30-39, Ancestry.com, (http://search.ancestry.com/Browse/view.aspx?dbid=8058&path=Alabama.Pickens.Not+Stated.3&sid=&gskw=John+Mangum : accessed 2012) digital image online of NARA microfilm publication M19, roll 2 Records of the Bureau of the Census, Record Group 29. National Archives, Washington, D.C.
 1880 United States Federal Census, Cove, Polk, AR, page 526D, dwelling 178, household, 183, entry for G.W. Crawford, 67, born in NC, father born VA, mother born VA, Ancestry.com, (http://search.ancestry.com/iexec?htx=View&r=an&dbid=6742&iid=4239966-00036&fn=G.+W.&ln=Crawford&st=r&ssrc=&pid=6565858 : accessed 2012) NARA microfilm publication T9, Roll 54, Washington, D. C.
 1850 United States Federal Census, Marion, Arkansas, Page: 312B (stamped), dwelling 47, family 48, entry for George Crawford, 37, birthplace Tenn., Ancestry.com (http://search.ancestry.com/iexec?htx=View&r=an&dbid=8054&iid=4193068-00013&fn=Newton&ln=Crawford&st=d&ssrc=&pid=9805410 : accessed January 2013) digital image online of NARA microfilm publication M432, roll 28, Records of the Bureau of the Census, Record Group 29; National Archives, Washington, D.C.
 1860 United States Federal Census, Population Schedule, Mountain, Polk, Arkansas, page 625 (stamped), dwelling number 223, family number 212, entry for George Crawford, 45, birthplace Tenn., Ancestry.com (http://search.ancestry.com/iexec?htx=View&r=an&dbid=7667&iid=4211307_00095&fn=George&ln=Crawford&st=d&ssrc=&pid=17688348 : accessed Jan 2013) digital image online of NARA microfilm publication M653, roll 48, National Archives and Records Administration, Washington, D.C.
(http://search.ancestry.com/iexec?htx=View&r=an&dbid=7163&iid=4259291_00054&fn=George&ln=Crawford&st=d&ssrc=&pid=13908978 : accessed Jan 2013) digital image online of NARA microfilm publication M593, roll 61, National Archives and Records Administration, Washington, D.C.
(http://search.ancestry.com/Browse/view.aspx?dbid=6742&path=Arkansas.Polk.Mountain.131.10&sid=&gskw=George+Crawford : accessed January 2013) digital image online of NARA microfilm publication T9, roll 54, National Archives, Washington, D.C.
 Bureau of Land Management, “Land Patent Search,” database, General Land Office Records (http://www.glorecords.blm.gov : accessed 2003), George W. Crawford, Polk County, Arkansas, Homestead certificate H697. Will the Real Nancy Catherine Nixon PLEASE STAND UP? On the wall of my Uncle Jesse’s home, in his living room, over the sofa, was the only piece of artwork I remember from his home. It was a picture, said to be of James Nixon and his bride, Nancy Catherine Nixon. The only picture I have that survives in our immediate family, is a photocopy of a photo taken from the original, below. A few years after going online with my genealogical search, another descendant of Nancy Catherine Nixon contacted me. She had a picture of James and Nancy Catherine Nixon said to be from their wedding day. She asked if I would like to have a digital copy. “Of course!”, I replied, although I fully expected to receive another copy of the picture above. What I received is the picture, below. As you can see, comparing the two photographs, these are not the same people. Either the couple above are James and Nancy Catherine or the couple below is, but they are not the same couple. I don’t have the original of either photo. So, I am not able to look at the photos or tell anything about them by physically examining them. Although I do know that photo number one, from my uncle’s house was oval and in an ivory frame which was very ornate. I think I remember something else about the photo which hung on the wall, which, if I am not imagining the memory, dates it to a precise time period. I will elaborate about that at the end. Both photos are said to have been taken on their wedding day. There are some distinct differences which may fix the date and solve the mystery of the identity of the two couples. For one, couple number one is dressed more formally with garments which appear to have been made especially for the event. Secondly, the style of dress of both couples is distinctive and not likely due to regional differences from the same time period. That is, the garments indicate that these photos are most likely from different eras. Perhaps details of their garments can help date the photo. From the hat, the neckline on the dress, etc, it appears that the clothing in picture number one is more formal. The second couple’s clothing is less formal and looks to have been less costly, perhaps indicating that they had less money than the first as Nancy two’s dress appears to have been taken from her closet, one of her best dresses, rather than a dress made especially for the occasion. The first photo has been digitally corrected to make it lighter. It was a very dark photocopy as you can see, above. Few details can be seen in the original picture. One thing that is apparent, is that the man is wearing a four in hand tie. Once the image was enhanced, the notched lapel on the jacket became apparent. It is outlined in the image to the below. The first photo, the Uncle Jesse photo, digitally corrected to make it lighter, shows that the man is wearing a tie or cravat knotted at the neck with a notched lapel on the jacket. It is outlined in the image to the left. The points on the collar of his shirt have a tight spread and line up approximately with the centers of his eyes. In the second, the man’s lapel is either not notched or is notched in a different location of the previous photo. The lapel is outlined in the photo, left. There is a possibility that a notch is located just above the bottom of the picture. The man is wearing a bow tie and his shirt collar is wider spread, lining up with the sides of his face. Both men have moustaches. James one’s moustache is smaller. Both women are wearing necklaces, the beads can be seen on both. The second woman’s necklace clearly has a drop or lavaliere and is of a “choker” style as it appears to be tight and sets high on her neck. The first woman’s necklace sits comfortably where her neck meets her shoulders. No clearly visible collar appears on her dress, the photo is not very clear and details of her garment are not very visible. There are some slight differences in intensity which suggest that her neckline of her garment was oval or v-shaped and exposed some skin on her upper chest, or perhaps there is a sheer material, organza, or some other type covering the area. If a sheer fabric were employed, then the cost of the garment increases, organdy, batiste and sheer silk fabrics were costly. 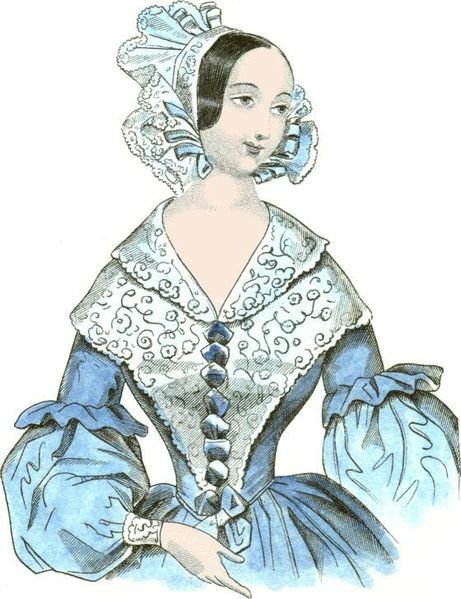 Unfortunately, we cannot see the full dress in either picture, to see how the sleeves are made and how the waistline and hip area was shaped, to see if there were a bustle, or some other information which would tell more about the garment to be able to determine a time period with greater accuracy. Nancy One’s neckline, her new husband’s lapel and her hat, appear to me to date to the 1840’s. Her neckline appears similar to the style of that in the image to the left, from Wikipedia. Her hair may also be in the ringlet fashions popular at the time. However, she is not wearing the bonnet style of hat popular in that time period. In fact, her hat looks to be like those popular during the 1860’s and 1870’s, which could clearly date the picture to the 1878 date of James and Nancy Catherine’s wedding. The James One’s tie is more of that of the 1870’s. James Two’s tie is more like one from the 1890’s. Additionally, the wealth and location factors need to be considered. Then as now, those with less means to have the latest fashions or in a location where news of what is current may lag behind for some time are not as current or in style. These people may have been five or even ten years b ehind in updating their apparel which makes dating the picture using the fashions difficult. 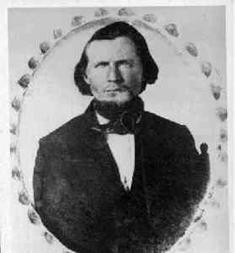 Compare, for example, the image to the right, said to be of my second great grandfather, Isaac Denson (1793-1875). Isaac wears a cravat at his neck, a style popular in the 1840’s and 1850’s. Was he current in his fashion or lagging behind? To answer that, consider that, according to the 1850 census, the value of his property Isaac was a wealthier man than the Crawford’s and the Nixon’s. In the 1850 census, the value of his property is listed as $1900. The property value of Nancy Catherine Crawford’s father, George Crawford, is listed as $150. James Nixon’s father, John Nixon, had property valued at $320. Isaac Denson was likely to have had the economic means to wear the current fashion. Isaac was a prominent man in his community, therefore, he probably updated his fashion, at least his tie, on a regular basis. In this fashion plate, also from Wikipedia, the men are wearing the same distinctive tie as Isaac. Therefore, this picture of Isaac, can be dated to the 1840’s or a later. Finally, what about that memory that I have of the Uncle Jesse photo? I remember was that it was not viewable from any angle other than straight on. That is, my mom pointed to the picture when I was on my way through the room, being a child of nine, I was itching to run outside and play with my cousins. She said something like “see that picture, that’s your great grandmother and great grandfather”. I probably shrugged my shoulders, she was thinking that I was indicating I was not so impressed, when, actually, I couldn’t see anything but a dark image, possibly resembling a negative, my memory is sketchier on the photo-negative part. My mother then stood me right in front of the photo in order to see it. If all of that is true, and my memory isn’t being inventive, then this means it was probably a Daguerreotype. Which means it was not of my great-grandparents, but could be of my great great-grandparents, George Crawford and Jane Mangum as Daguerreotypes were only made from 1840 to 1850. I suppose by now everyone is getting quite tired of the Cases. In fact, I am tired of chasing my tail looking for information on them, too. But, you guessed it, I found a bit more information on a collateral family. Recall that Catharine Unknown Case married W. Callaway McGreggor, soon after Joshua Case‘s death,. This marriage lasted less than ten years as a marriage is recorded for Callaway W. McGreggor to Sarah Clore, her name actually Close, in Randolph County, on 08 Jun 1843. A record of divorce for Catharine and Callaway has yet to be located. The last land transaction I have located for Catharine and Callaway was in 1841, so the divorce happened sometime between then and 1843. Determining that Sarah’s name was Close not Clore and that she was the widow of Henry Close, was determined by examining the probate records. On 16 June 1843, John W. Close appeared before the probate court regarding his receipt “from Sarah Close (now Sarah McGreggor) his guardian, the sum of $263.60 in full for his share of his fathers [sic] personal estate, & of William T. Evan‘s estate”. Could this mean that Sarah ‘Unknown’ Close McGreggor was an Evans? If not, what might her family name be? Searching for the Will of William T. Evans is a bit tricky as it is noncupative, that is oral. There may be a recording in the will book which answers more of these questions, good thing this film is extended as it looks like I am going back for another look! Henry Close died intestate and Sarah was appointed administratrix of his estate. More clues to her identity lie in the probate records and in the censuses of 1840 and 1870. On 12 June 1843, Norton H. Close, who was at that time a minor over fourteen years of age, chose John W. Close for his guardian. Previous to this, Sarah had been his guardian as in the same order “the letters of guardianship heretofore granted to Sarah Close as guardian of Norton H. Close” were revoked.” Thus, Henry Close had a son named Norton, presumably, this son was also Sarah’s son. Could Norton have been named for a close relative? In the 1840 census, a Norton Hull, Joseph H. Orr and Henry Close are enumerated, together on the same page of this census. Norton Hull came to Randolph County, Illinois from Kentucky. He arrived with his brothers, Samuel, Lewis and Thomas, in “the O’Hara Settlement in 1818”. The Orr’s, Joseph and Thomas, arrived in the same year. In the 1870 census, Sarah McGregor,69, is enumerated with Sarah Close, 18, and Callaway Close, 21. The Family enumerated above them is that of Henry and Ann Orr. According to “Pike County, Illinois Genealogy Trails”, Ann Orr is the daughter of Reverend Thomas and Mary Smith Hull; Thomas was the son of Samuel Hull and Barthena Norton, which makes him a brother to Norton Hull. Sarah and Callaway McGregor moved to Pike County sometime before 1850, as they are enumerated there in the 1850 Federal Census, wherein Callaway’s occupation is listed as “Doctor”. Finally, back to the Archives of Illinois which has a death certificate listing for Sarah McGregory in Kinderhook, Pike County, Illinois, 6 Mar 1878. She is listed as 77 years old at the time of her death, placing her birth year somewhere near 1801, which is consistent with the 1870 Census. If she were a Hull, then she is of an age to have been a sister. Why should anyone interested in the Case Family of Randolph, County Illinois care about Sarah Unknown, possibly Hull, Close McGreggor? I mean other than the WTF happened here with the divorces and the relos and aside from the fact that, if she is a Hull, then she has been overlooked in previous listings and publications of the children of Samuel and Barthena Norton Hull. Putting all that aside, remember the guardian of Olive, Independence and Jackson Case? True, it is possible that the guardian, Joseph H. Orr, was a “guardian for hire” that is, he was a trusted, prominent citizen who had sufficient wherewithal to have been appointed guardian and he was appointed only for those reasons. I had begun to believe that this was exactly what had happened. However, seeing this mix of Orr, Hull, McGreggor and Close families makes me wonder if there is more to these connections then I had begun to believe. Looks like this is going to take a whole lot more work. Monroe County, IL, County Clerk, Manuscript/Manuscript on Film, Salt Lake City, Utah : Film number 1006355, Filmed by the Genealogical Society of Utah, 197. Marriage records, 1816-1915. “Illinois Statewide Marriage Index, 1763-1900”, n.d. http://www.ilsos.gov/isavital/marriageSearch.do. Randolph County, Illinois. Probate Records 1809-1849. Film number 974986, 1832-1843, Preservation Filming, Salt Lake City, Utah, Filmed by the Genealogical Society of Utah, 1975. Ancestry.com. 1830 United States Federal Census [database on-line]. Provo, UT, USA: Ancestry.com Operations, Inc., 2010. 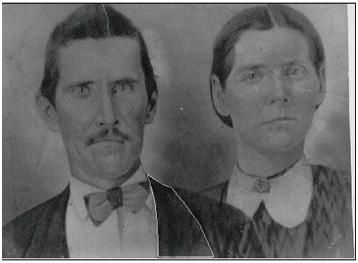 Images reproduced by FamilySearch. 1830 US Census; Randolph, Illinois, 138; NARA Series: M19; Roll Number: 22; Family History Film: 0007647. E. J. Montague, “A Directory, Business Mirror, and Historical Sketches of Randolph County,” Google Books, http://books.google.com/books?id=dTAptDpexbAC&pg=PA107&dq=norton+hull+randolph+illinois&hl=en&sa=X&ei=yZC6T-_nHabl6QHUm7yCCw&ved=0CEsQ6AEwAw#v=onepage&q&f=false (accessed May 21, 2012). “Pike County, Illinois Genealogy Trails”, n.d. http://genealogytrails.com/ill/pike/cemakersm-z.html. “Pike County, Illinois Genealogy Trails”, n.d. http://genealogytrails.com/ill/pike/cemakersa-l.html. Year: 1850; Census Place: Township 4 S 6 W, Pike, Illinois; Roll: M432_124; Page: 180B; Image: 490. Ancestry.com. 1850 United States Federal Census [database on-line]. Provo, UT, USA: Ancestry.com Operations, Inc., 2009. 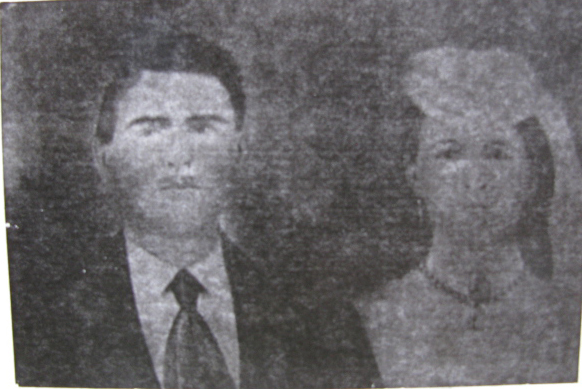 Images reproduced by FamilySearch. “Illinois Statewide Death Index.” ILLINOIS STATE ARCHIVES. http://www.ilsos.gov/isavital/deathSearch.do (accessed May 21, 2012). Harold Henderson in his blog post Midwestern Microhistory: A Genealogy Blog asks this question, “Why don’t We Write”. Frankly, I write. And write and write! What I don’t do is publish. In fact, I have fears of publishing anywhere but here. I know that I need to publish. I am well aware that, well, with no pretensions of Louis-esque grandeur, après moi, le déluge. Okay, maybe not chaos, but I have no delusions that my children will care one whit about the research into our family. Pretty sure that, after I am gone, the research will be gone, too. I need to publish so that what I know is not lost. In addition to publishing, I need to share. Publishing solely in a paper based fashion without the ability to share research with the wider world, either via film or other shareable means, renders the research as inaccessible as if it were still in my basement, stacked in boxes, just waiting to become so much papier-mâché. Sharing only on my blog will eventually be just as temporary as an obscure family history tucked away in an unreachable library. For my research to survive a generation, I must publish and share. DNA evidence of a descendant of Andrew Jackson places him in the Case family of Connecticut and New York. But to which Case family does he belong? There is no one else in Randolph County, IL of the same surname. He is not likely a brother to the Coe Wisner, sometimes spelled Weasner, Case of the neighboring St. Clair county and his brother, Jonathan Wood Case in Wabash County, IL. Coe Weasner Case and Jonathan and other sons are named in the will of their father, Daniel of Minisink, Orange, New York. There is no Joshua among them. According to the Popenoe, Popnoe, Poppino & Allied Families, and Dlouhy Family Ties websites the children named in the will are Jonathan, Coe Wisner, Daniel, David, John Elizabeth, and Julianna. Another daughter, Maria, was born after Daniel’s death. Comparing the number of males in Daniel’s family in census records, 5 in 1800 and 5 in 1810, to the number of sons as named in the will, suggests that Joshua was not a previously settled upon and therefore unnamed son. However, I want to examine the will or a transcription of it before ruling them out, completely. Especially since Independence places Joshua’s birthplace in New York and Catharine’s in Indiana in both the 1880 census and 1900 census. If this is accurate, he might be a cousin or some other relation to Coe Weasner and Jonathan Case brothers of Illinois as they were born in Orange, New York. However, Olive states nothing for his birthplace in the 1880 census and Ohio in the 1900 census. Jackson states both of his parents were born in Iowa in 1880 and in Massachusetts in 1900. I could try searching New York, having searched the deeds and wills of relevant and possibly connected families of Randolph County, Illinois. How many Case families could there be in 1830, right? Turns out, a bunch. In 1830, there are 354 families named Case found in Ancestry.com’s index. I could start in Orange County, where the pool narrows substantially, to fifteen, or even narrow it to Minisink, where the pool drops sharply to four, three if Daniel is not considered. Even so, if this Joshua is not named in a will, then I am back to square one. Frankly, a Joshua named in a will would tell me next to nothing if there were no supporting details to tell me that that Joshua was my Joshua. Joshua witnessed a deed in 1829 in Randolph County, between Charles S. Guthrie, James S. Guthrie, Samuel S. Guthrie, Joseph S. Guthrie, and Cathrine S. Guthrie, and John S. and Polly S. Guthrie. He witnessed this deed with James Hathorne, sometimes spelled Hawthorne. I am currently digging through the films for more records involving this James. From the Probate records, all of the Guthrie’s were heirs of George and Nancy Guthrie. James Hathorne was likely the son of a Samuel Hathorne, whose minor children were Elizabeth, AKA Betsey, Hathorne, James M. Hathorne, John Hathorne, David Hathorne, and Saira, I’m guessing that’s Sarah, Hathorne. James Hathorne and Samuel Hathorne were appointed guardians of the minor children of Samuel Hathorne. In 1830, Joshua bought his land from the heirs of William Peach. These heirs are named in the deed: William Peach and Priscilla, his wife, Levi Simmons and Lois, his wife, William Simmons and Mary his wife, and Charles Darrow and Sally, his wife. Lois, Sally and Mary are the daughters of William, that is they are, Lois Peach Simmons, Sally Peach Darrow and Mary Peach Simmons. Additionally, Priscilla Peach was a Simmons. Clearly, there is a heavy association between the Peaches and the Simmons. I searched the deeds and wills and probate records on film for Randolph County, Illinois to learn more about the Peach family and the Simmons families. William Peach died intestate sometime before 30 Nov 1824. Sarah Peach, presumably his wife and not his daughter, and William Peach received letters of administration for his estate. A little online research revealed that my assumption that she was his wife was correct as Sarah Pearce and William Peach married 22 January 1800 in Marblehead, Massachusetts. Other heirs unnamed in the deed who were minors at the time of the death of William Peach, were Samuel Peach, John Peach and Eliza Ann Peach. The Peach family of Randolph County, IL has origins with the Puritans of Marblehead, Massachusetts. The Case family was Puritan when they arrived on the shores of America, they settled in Connecticut and Long Island. In 1833, Joshua’s will was witnessed by Luther Simmons and John C. Crozier. Luther Simmons married Nancy Crozier, sister of John C. Crozier. John C. Crozier married Mary “Polly” Lindsay. This may be significant, as Independence Case married a Beverly Lindsey, 16 Apr 1840. Joseph H. Orr was appointed guardian of Olive, Independence and Andrew Jackson; Charlotte chose John C. Crozier as she was over fourteen. So there it is. The entire incomplete little tome. It seems that I can find the marriage records and families of everyone’s marriage record except Joshua and Catharine. Where to go from here? Here is a list of what my choices appear to be. First search all the films for Randolph County, Illinois, read every deed between 1820 and 1844. Then search the available films of Indiana marriages on the off chance they married there, or maybe they married in Arkansas, so search those, too, or maybe the JP lost the crumpled piece of paper with their marriage record on it, in which case you have wasted a lot of money, time and vision. Then search all the wills in New York on the chance that there is a Joshua named therein who can’t be tied to a family or who is obviously “mine”. Gee, I wish I could get my hands on a film of the St. Clair gazette from 1833-1834. Year: 1880; Census Place: Jefferson, Newton, Arkansas; Roll: 52; Family History Film: 1254052; Page: 635A; Enumeration District: 117; Image: 0575. Year: 1900; Census Place: Murray, Newton, Arkansas; Roll: 70; Page: 15B; Enumeration District: 90; FHL microfilm: 1240070. Year: 1880; Census Place: Clay, Clark, Missouri; Roll: 681; Family History Film: 1254681; Page: 114A; Enumeration District: 035; Image: 0232. Year: 1900; Census Place: Clay, Clark, Missouri; Roll: 848; Page: 2A; Enumeration District: 18; FHL microfilm: 1240848. Year: 1880; Census Place: Jefferson, Newton, Arkansas; Roll: 52; Family History Film: 1254052; Page: 637A; Enumeration District: 117; Image: 0579. Year: 1900; Census Place: Boston, Newton, Arkansas; Roll: 70; Page: 3A; Enumeration District: 92; FHL microfilm: 1240070. Her name is rendered as Catharine in the Probate record. Marriage records, Randolph County, Illinois, 1809 to 1870, Married: 29 Nov 1824 in ,Randolph, Illinois, USA, as accessed on Bourdon, Claudia: Claudia’s Families. Ancestry.com. Massachusetts, Town Vital Collections, 1620-1988 [database on-line]. Provo, UT, USA: Ancestry.com Operations, Inc., 2011. Original data: Town and City Clerks of Massachusetts. Massachusetts Vital and Town Records. Provo, UT: Holbrook Research Institute (Jay and Delene Holbrook). Ancestry.com is a great tool. Their commercials seem to imply that all you have to do is enter a few names and Presto Magico your entire genealogy will unfold with the touch of a leaf. This is as naive as my belief, when I was a wizened sage of 17 and just starting my genealogical pursuits, that all the records were on file, birth certificates, marriage records, death certificates, etc. Ha ha ha ha ha. Granted there are many researchers of high caliber willing to share. There are, however, significant problems with some of the information that others upload. Information can be inaccurate and is usually unsourced. Unsourced information is actually better for researchers who know enough not to accept everything given to them as fact, just because someone says it is so. The more dangerous error is when sources are attributed to an event that aren’t really about that event. For example, the Thomas Crawford of McMinn County, Tennessee who married Priscilla Barnett. If I click on the leaf in my FamilyTreeMaker next to the name of Thomas Crawford, born in Virginia, whose wife’s name is not yet known to us, I get a links to trees which suggest that he is the son of Samuel Crawford and Nancy Forgey, some skip the Priscilla Barnett as wife part altogether. My information and that of other researchers indicates that the Thomas Crawford, who was married to Priscilla Barnett, was born in 1788 in Tennessee or South Carolina and died in McMinn County, Tennessee in 1839. This would make it highly unlikely that he would be alive and enumerated in Itawamba County, MS. Thus, Thomas Crawford of Tennessee could not have been the Thomas Crawford who fathered Meeky Crawford Evans and others. Which brings up Meeky Crawford Evans. 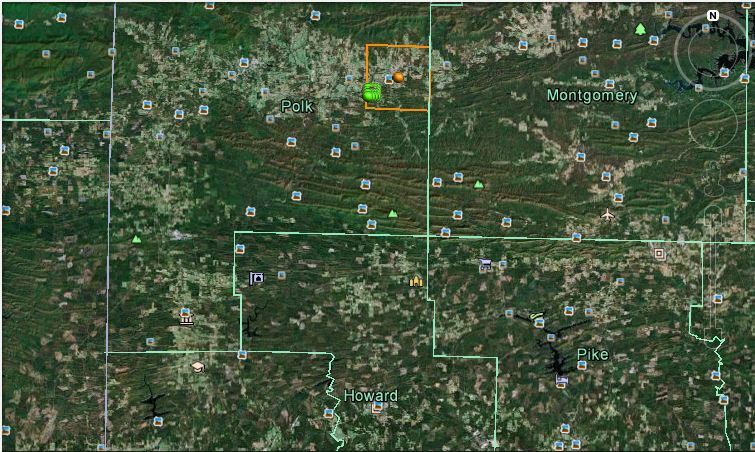 Meekey, possibly Mary Ann, Crawford is presumed to be a daughter of Thomas as she is living near him in the Federal Census for 1850 of Itawamba County, MS. Thus she could not have been the Mary Crawford enumerated in Lowndes County in 1860, with a different husband and different children. All of this could possibly happened because one person got a leaf, then merged and before checking the facts and the sources. Moral to the story watch out for that leaf. Much has been said recently about another Paula, Paula Deen, and her paid endorsements for a medication to treat Type II diabetes. Most claim to be upset by the fact that she had been diagnosed with Type II diabetes a few years ago and continued to make food high in fat on her show. Seems that there are those who wish to crucify her for, shocker!, showcasing classic Southern cooking. Come on, leave Paula Deen alone, in the South, we deep fat fry the water. There is a giant dose of Northern snobbery and egotism going on here. Along with a good deal of ignorance of both type II diabetes and history of American food. Our Southern foodways are a part of the folkways brought from Southern England whence many Southerners emigrated. The critics of Paula Deen are mostly located in an area where the foodways and folkways are from Norwich. Their New England influenced aesthetic which, according to Albion’s Seed, associated their “plain cooking with piety” and “vegetables with virtue”. The difference is as clear as Fried Chicken and New England boiled dinner. Also clear, from my readings, is that weight is a trigger for those who have the genetic predisposition to type II diabetes. There are people who live their lives obese and never develop Type II diabetes. Those people simply do not have the genetic markers for obesity. Now, don’t jump on me, I am not claiming nor am I advocating that obesity is healthy. Certainly, Paula Deen does not, nor do I, advocate deep fat frying everything you eat. I am saying that the experts I read say that the genetic marker is the sine qua non of diabetes. I have a personal interest in this topic, as type II diabetes pops up in my family, occasionally. The occasion tends to be if you don’t inherit the tall genes, and you do become overweight, you are at increased risk of Type II diabetes. For those who I know in my family who became diabetic or prediabetic, quitting smoking made us gain the weight, since it revs then decimates one’s metabolism. Even more personally, recently, I have one blood sugar test result which puts me in the range of prediabetes. One other test is normal. Ethnic background. Diabetes occurs more often in Hispanic/Latino Americans, African-Americans, Native Americans, Asian-Americans, Pacific Islanders, and Alaska natives. So far, I have found no Latinos, though I would say that is highly like to also be a Native American genetic marker, nor African Americans, nor Asians nor Pacific Islanders. In my family, we have legends of American Indian ancestry, not Inuit, but Cherokee. I know, doesn’t everybody? This legend is from the Langford side of the family, my father’s father’s side of the family. DNA is no help to us here, since it is through a maternal line on that side, therefore the Y-DNA is not American Indian, but Ultra-Norse. Vikings are not so prone to type II diabetes. For DNA to help point the way, we’d need someone descended from daughter to daughter of Mary “Polly” Crane to determine if she was American Indian or not. There is another direction to look. It is possible that the type II diabetes came through the Dixon side of my family, my father’s mother’s side. This conclusion is formed by tracing a pattern of heart disease. You see, my father, whom we know to have been diagnosed with type II diabetes, died of heart disease. Ten years prior to his death, at the age of 68, while he was in surgery for a triple bypass, a Dixon cousin, happened to be in town and dropped by with some Dixon genealogy, much of which he had learned from Wilma Cowan Dixon. In this packet, was a letter from Alexander “Eck” Dixon, to my grandmother. In it, he talked about the doctor’s recent diagnosis of his heart disease. The doctor had told him that, if he didn’t do anything and just took it easy, he might live a long time yet. He was also 68 years old. He died the day after writing the letter. Pictures of him do not show him to be a morbidly obese person or frankly even obese. Peak of your twenties thin, like my maternal grandfather? No, not thin, but not obese. Of course, it is possible that he had other risk factors, perhaps he smoked, which put him at risk of heart disease. The coincidence of his age at diagnosis and the age of my father’s diagnosis can’t be overlooked. Here’s where the mystery kicks in. Alexander’s father is not definitely known to us. 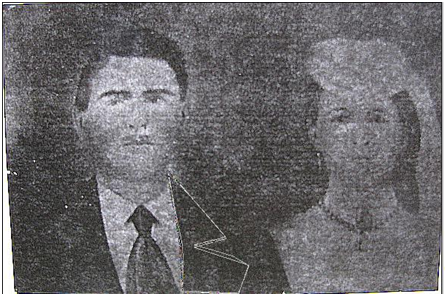 We know that a marriage was recorded between Margaret Dixon and Robert Sandlin in Breathit County, KY on 14 Dec 1854. As he married Elizabeth Bowling some four years later, we can assume hope that a divorce or annulment occurred. As Margaret was about 14 of the time of the marriage, my bets are on the latter. Alexander was born fourteen years after this marriage was dissolved. Another possibility needs to take into account his middle name of Crittendon. Was this a clue to a father? We might look to Margaret’s family as well. It is possible that someone in that line was American Indian, but the ancestral line of the Dixon’s and the Creech’s are pretty well known and, so far, no Native American lineage is found. There is work to be done here. If there is a Dixon descendant of Alexander Crittendon Dixon out there willing to take a Y-DNA test, that will help a lot. But, in the meantime, there is paperwork to track down. And for all those calling Alexander Crittendon Dixon by the name Sandlin, STOP IT! Geez, this is getting as tiresome as that Jedediah Brown business. I know old family tales die hard. Sometimes, it takes a lot of evidence to put these tall tales to rest. For example, DNA evidence was required to separate the Stephen and James Langford bunch from the John “Jack” and Rufus Wiley Langford bunch. For years, they were all thought to be brothers and their father said to be a man named John or perhaps Eli. Long story short, the four are not genetically brothers, well, technically Stephen and James may be brothers and John “Jack” and Rufus Wiley may be brothers, but the DNA of Stephen’s descendants doesn’t match that of the descendants of John “Jack” or Rufus, etc. Now we know that Eli is likely the father of the former two and we have a few clues for the father of the latter two, none of whom is named John. This genealogical misunderstanding occurred due to an interview of a grandchild of James Langford, in which a statement made was misinterpreted. Something like that happened to Jane Mangum. A record was misread, the wrong conclusion was reached, this was passed along as truth. It was then published in a book. But inventing fiction? That is galling. Especially after this fiction has been proven wrong. Sigh, this is just getting so tiresome. Let’s get this straight, one more time. Why am I revisiting this? Well, a question popped up the other day on a list to which I belong, regarding same name syndrome. The question was “Can you give examples where someone has glued two family trees together erroneously due to ‘the name is the same’?” My example was, of course, Jane Mangum, daughter of John Mangum, the Patriot. BT-dubs, we don’t call him the Patriot out of associative pride, but due to the many men named John Mangum who existed at about the same time and within the same line. After seeing the question, I decided to check on Jane Mangum on WorldConnect and on FamilyTreeMaker’s site. After all, it has been several years since this information was found, surely most people have begun to correct their trees. Nope, now they are making up children. Just when you think you have done your genealogical duty, somebody blows you off. There are those who refuse to believe a fact pattern supported by documentation: census, written depositions of members of the family from the time period, in this case a nephew, Marriage Records, etc., and refuse to disavow fiction which was born of ignorance of Jane’s life. You see, Jane was the only one of Rebecca Canida Knowles Mangum’s children who did not become Mormon. Hale didn’t know the facts of Jane’s life because neither Jane nor her descendants lived near her at the time the DAR application was made or the book was being written. Likely, the marriage information became “pass along”. Initially found in Hale’s book, it was passed from family member to family member. There was no one, until the advent of the internet, who challenged it. I am also pretty clear that whatever “work” was done, was done for these new fictitious children was done with nothing more in depth than a search on Ancestry.com or from within Familytreemaker, so there is no need to go further than that to keep disproving this. The citation on this entry for Jane’s alleged marriage to Jedediah Brown in 1855 is actually a link to Ancestry’s copy of her marriage to George Washington in 1841. Jane was not a polyandrist. It defies logic to assert that Jane had Thomas Jefferson Crawford in 1845 and Martha Jane Brown in 1845. This Martha Jane Brown is said to have been born 10 years before the fictional marriage to Brown. In fact, the Ancestry.com census search for Martha J. Brown born 1845 in Mississippi does find one person, in the 1850 census, the daughter of Simeon J. and Manerva Brown in Holmes County, Mississippi. There is another Martha Brown, daughter of David and Eliza Brown in Lafayette County, Misssissippi. There is a Martha J. Brown in the 1880 Federal Census enumeration for Panola County, Mississippi, in a household headed by a Jane Brown. Martha J. and her mother Jane are enumerated as black. Jane Mangum daughter of John Mangum, was white. 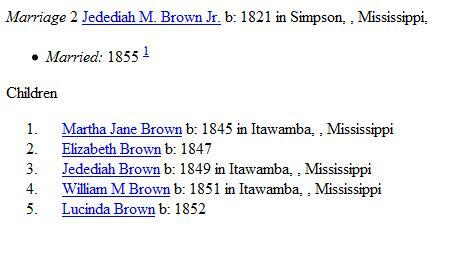 In 1850, in Mississippi, there is only one Jedediah Brown, son of Samuel and Elizabeth, in Yalobusha County. He’s fourteen. In 1870, there is a Jedediah Brown in Bountiful, Utah. He is in the Rebecca Brown family. He’s 4. From the information from Kerry Petersen, above, this is probably the Jedediah Brown who is in the midst of all this confusion. We find Jedediah M. Brown listed with wife Elizabeth, born in England in 1866, again in the 1900 Federal census for South Precinct, Davis, Utah and the 1910 Federal Census for South Bountiful, Davis, Utah. He definitely was not married to Jane Mangum. His children, enumerated with him in 1900 are Samuel, Agnes, Leo F., Elsie E. and Lucy L. In 1910, the children listed are Samuel J., Agnes A, Frederick L, Afton and Emily. In the Federal Census for 1920, now in Salt Lake, Utah, we find Jedediah, Elizabeth, Afton and Emily. How does this happen? What can we do to prevent it in our own genealogical work? To paraphrase the old real estate adage, “citation, citation, citation”. Meaning, we need to be able to trace the provenance of every fact included in the database. Otherwise, if the pertinent information is called into question, we have no way of knowing what to believe. Of course, whenever possible it pays to make our sources primary, from original documents. Had this been done, Jane’s marriage to George Crawford would have been in Hale’s book, not the erroneous Brown marriage. When I say primary, I mean the original document attesting to the actual event at the precise time it occurred. I don’t like using the terms original or derivative, mostly because in my mathematics related Master’s degree, a derivative is a precise mathematical term referring to measuring how a function changes as the input changes. The sense in genealogy is defined as an item being derived from another source, that is, secondary. If we can trace the provenance of everything in our database, then erroneous information can be detected by following the trail. Hale’s assertion in her book for the Brown marriage was not based on a fact. If the information in a database is from Hale, then it needs to be removed from that database once a primary source is found which disputes her information. If it is unsourced in the database, perhaps passed from one family member to another without citation, then how can it be determined to be truth or not? It can’t without extensive research. If you don’t cite, you could wind up researching one fact over and over and over and over again. Also, we must avoid making facts fit the truth as we think we know it. In this case, a “pass-along” genealogy with a phony fact, the Jane Mangum – Jedediah Brown marriage, was the jumping off point. No record could be found for that marriage, it didn’t happen, so it doesn’t exist. To substitute, the census records, above, may have been used to change her name to Eliza Jane, since Jedediah Brown was married to Elizabeth thus making one fact fit the truth as the researcher thought he or she knew it. Of course, there is always the possibility that someone just made it all up. Stitching together Olive’s family and tracing her descendants as they moved about sometimes involves some twists and turns. For example, Olive had three sons, Shelton Joshua or Joshua Shelton, George and Perry. I can find a marriage only for George, who married Annie Egley. George and Annie had a son Perry. After Annie’s death, George married Addie Ramsey Howes. George, Addie, two of her Howe children, Dollie and Charlie, as well as his son Perry are enumerated in 1920 in Clark County, Missouri. Perry Evans, the elder, cannot be located in Clark County, Missouri after the 1910 census, where he is enumerated living alone. Perry Evans, the younger, George’s son, cannot be found in Clark County, MO, after the 1920 census. He may have moved around a bit, as there is a Perry Evans enumerated in District 5, Alfalfa, Burlington County, Oklahoma in 1930. SSDI has a record for a Perry Evans who died in 1963 in Kansas, whose card was issued in Oklahoma. Here comes one of the twists, there is a Perry Evans enumerated in 1920 in Buchanan County, Missouri, a resident of St. Joseph’s Hospital No. 2. Although I saw this name pop up on census several times, I didn’t connect him with “my” Perry Evans until later. I disregarded the information, thinking that “my” Perry moved on or died. And yes, I know, that sometimes, in fact, most times, to trace family history, you have to connect the dots, that is, your ancestors probably didn’t behave as expected, nor did they leave nice letters or books or other tomes telling you who was related to whom, how they all came to be in this place or that and what exactly was up with Uncle Terrence being in the home for the last thirty years of his life. Sometimes Usually they specifically leave that part about Uncle Terrence out altogether. So, because he had the right name but was in what I thought was the wrong place, I didn’t pay enough attention to this Perry in Buchanan County. Then I searched the Missouri Digital Archives for Perry Evans, this time leaving off the county designation of “Clark”. There are four death certificates for men named Perry Evans. One is for the Perry Evans of Buchanan County. He is the only one who was born in Clark County. His birth date is listed as 1860. At first glance, I almost discounted this Perry as his name was given as Perry Evans, Sr. and my brain behaved, in complete twentieth century fashion, at first assuming that this designation may have indicated that this Perry Evans had married and had a son who was named Junior, I knew that “my” Perry had been single in 1910 and likely remained that way, with no children. Yes, I do know that, historically, Senior and Junior designations did not necessarily imply Father and Son, or even a relationship, but was a designation for the Elder and the Younger. But, still I wondered, had I made an incorrect assumption? The death certificate for this Perry listed his status as single, not widowed or divorced, so perhaps not. The names of his mother and father are not on the death certificate, rats! The only connecting information is the name of the informant, Perry Evans, Jr. of Burlington, Oklahoma. Oh, and here is the twist of twists, Perry Evans, Sr. had been living in the St. Joseph’s State hospital No. 2 for over 27 years. Why was he there? Well, not everyone was in the St. Joseph state Hospital No 2 for insanity. Those who could not cope living alone were often placed there. If we examine a few more facts about Perry and his mother Olive, we might have some clue about why he was there. Of course until his records can be located, if they exist, all of the following is mere theory. Perry was the last of her children. He was born in about 1863, Olive would have been about 40 to 43 years old, depending on the census information she provided, most likely the younger of the two based upon guardianship information from the estate of her father. That is, she couldn’t choose her own guardian as she was not over 14 within six months of her father’s death, in late 1833, so it is more likely she was ten rather than thirteen. Perry probably didn’t have Down’s syndrome, given the time period, those with Down’s syndrome would have had a difficult time living past the age of sixteen or seventeen at the latest, Perry lived to over eighty. He died of broncho-pneumonia due to arteriosclerosis [sic]. There is no mention of dementia as a contributing cause, had he been older than 54-60 when he arrived at the institution, the atherosclerosis might have caused some dementia and been the reason he was admitted to St. Joseph. There are several lessons to be learned from this case. One general lesson learned is that people may not be where you expect them to be. So, if no records are found in the county in which you expect to find your ancestor, search all counties before presuming that he left the state. Perry couldn’t be identified as the correct person from the census alone, but it was a piece of the puzzle. Lastly, one document may confirm information about more than one person. Perry’s death certificate also confirms that the Perry Evans from SSDI records is likely “my” Perry Evans. The SSDI records have Perry born 14 Feb 1888. My Perry was born in Feb 1888, according to the Federal census of 1900 for Clark County, Missouri. SSDI Perry died in Kansas in 1963 and his Social Security card was issued in Oklahoma. According to Perry Evans, Sr.’s death certificate, my Perry Evans, the son of George Evans, lived in Burlington County, Oklahoma. marriage contract between Levi Davis & Amelia Evans. Filed for Record 23 day of March 1875 Thos G Palmer (or Thomas Walmer) recorder. Missouri Marriage Records. Jefferson City, MO, USA: Missouri State Archives. Microfilm. p 61. In the search index on Ancestry.com, Levi’s name is transcribed as Carris. On closer inspection it is actually Davis. The ‘D’ has a large swoop on it making it appear to be a ‘C’ until compared with other upper case C’s on the page. This was an “aha!” moment for me, after reexamining this record, I realized that I would not likely find an Amelia Carris anywhere and that Amelia may have survived and had children, giving hope that Olive’s line may not have died out. The goal is to connect this Amelia to Olive Case Evans and determine her children, if any, and her date of death. So, there are many questions to be answered. First, is this Amelia Evans the daughter of Olive Case and Washington Evans? Second, can I find her in censuses in 1880 and beyond? A third question arose when I changed Levi’s name in my family tree maker database, from Carris to Davis. This brought up other databases with a marriage of Levi Davis to Amelia and also to a Martha K. [Unknown]. Could the Levi Davis who married Amelia Evans in 1875 be the same Levi Davis who married Martha K. [Unknown]? Did Amelia Evans Davis have children who survived to adulthood and, in turn, have children of their own? Is Amelia Evans Davis the daughter of Olive Case and Washington Evans? To be answer this I began with the census. First, to establish the age of “our” Amelia Evans, I looked to the 1860 and 1870 censuses for Olive Case Evans. There we find Amelia listed in the household with an age of 4 in 1860 and 14 in 1870, and born in Missouri. Searching Ancestry.com, there is no other Amelia in any families in either of these censuses in Clark County. Next, I looked at the 1880 census to determine if Amelia Davis’s age and other characteristics are a match to Amelia Evans. Levi and Amelia are enumerated on page 208 D in Lincoln Township, Clark County, Missouri, Supervisor’s District 5, Enumeration District 41. Amelia Davis is listed as 24 years old and born in Missouri, both of which fit “our” Amelia. Her parents birthplaces are listed as Illinois, for her father, and Iowa for her mother, neither of which fit Washington or Olive, but, especially as we don’t know who was the informant, it is not a complete “deal breaker”. Did Amelia Evans Davis have children and what are their names? 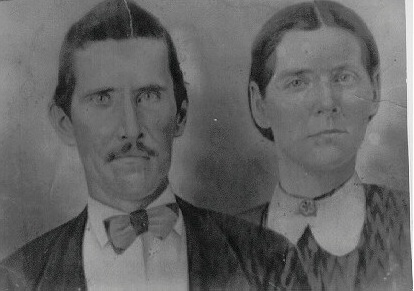 Levi Davis and Amelia Evans are enumerated in 1880 with their two children, Thornton, 4, born in Missouri and Jonathan, 2, also born in Missouri. As the 1890 census is destroyed, no census information can be found for Levi and Amelia or other children. After 1890, a Levi married to Amelia is not found in searches on Ancestry.com. This brings up a new set of questions. Did Levi or Amelia die or both before 1900? Did they move from Missouri? Did a death or divorce occur before 1900 leading Levi to remarry to Martha K. [Unknown]? Is their name mangled beyond soundex recognition? What is Amelia’s death date? So far, it has not been very easy to answer the question “was Amelia living after 1880” by using only the census and indexed searches for Amelia Davis. One clue may be found in the census of 1900 for Olive Case Evans. On page 178A, Clay Township, Clark County, Missouri, Olive Evens [sic] is enumerated, with Perry, Shelton J., and Independence in the household. Olive is listed as being born Oct. 1820, and as having nine total children, with six living. I have eight of her children named in my database: Catharine (1842-before 1870), Mary Ann (1846- before 1860), Independence(1849-1900+), Roxanne(1850-1934), George(1853-1920+), Amelia(1856-1880+), Joshua Shelton(1860-1945), and Perry(1864-1910+). Did Olive have nine or did she have eight? The total may be important to determine if Amelia is still living in 1900. That is, if Olive’s statement wasn’t due to faulty math, i.e., “lets see, I think I had nine and three died”, when she actually had eight with three dying, leaving a total of five, then, as I can account for everyone else in either 1900 or after that date, Amelia is likely living. How can we be certain that Olive had nine or eight? I believe that the possibility is high that she had nine, as there is a four year gap between Catherine and Mary Ann, which is larger than the gap between remaining children. The statements from the 1900 census also serves to establish Catherine and Mary Ann as Olive’s and Washington’s children, not the children of Washington from a previous marriage. Now that is a convoluted way to get at a conclusion. I believe that Catherine Evans Sortore, born in 1842, and Mary Ann, born 1846, were deceased in 1900. For Catherine, I find a marriage of a Catherine Evans to Jackson Sortore in the records of Clark County, Missouri, in 07 Oct 1858. In the 1870 Census, I find a Jackson Sortore and wife Margaret in Sullivan County, Missouri. This, coupled with Olive’s statements on the 1900 census, leads me to believe that Catharine died prior to 1870. I cannot find information for Mary Ann after the 1850 census. Although it is possible that she married at 14, it is not too likely. In 1900, I can account for Independence, Roxane, George, and Joshua Shelton and Perry among the living, for a total of five. More research is needed to attempt to determine which of these possibilities exist, that Catherine divorced Jackson Sortore and she rather than Amelia is alive in 1900, that Amelia is alive and not found by the census, or Olive misspoke and she had five children living. Is the Levi Davis enumerated with Martha K. the same as married Amelia Evans? Lastly, could the Levi Davis who married Amelia Evans be the same Levi Davis who married Martha K. [Unknown]? In the census of 1900, page 116 A, Supervisor’s District 155, Enumeration District 17, Anaconda Township, Dew Lodge, Montana, there is a Levi Davis is married to Martha K. [surname unknown]. This couple has been married for 35 years. Doing the math places their marriage year as 1865, prior to Amelia Evans’ marriage to Levi Davis. Therefore, this is not the same Levi Davis, but is a case of same name syndrome. Amelia Evans married Levi Davis and had two children, at least. She cannot be located using Ancestry.com census searches after 1880. More investigation into her is needed to determine her fate.